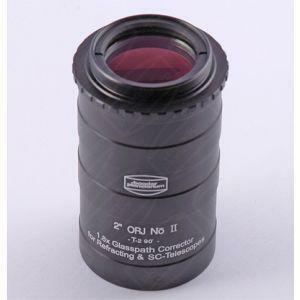 2" x 1.7 Glass path corrector with integrated coma corrector, this is for use with Binocular Viewer with Newtonian telescopes. Whilst being a very popular and successful design, the drawback of Newtonian Telescopes is their limited back focus, this means that some accessories (such as the mark V Binocular viewer) can struggle to achieve focus, one solution was to use a barlow lens to try and extend the focal plane, this, however successful, increases magnification and reduces field of view. Baader, in collaboration Zeiss optical designers, have designed and built this specific coma correcting focus extender for use specifically with Newtonian telescopes. Not only does this product remove Coma, but it also incorporates a glass path corrector to reduce the chromatic abberation and spherical abberation inherent in bino viewers. This corrector has a large clear aperture to avoid vignetting while coatings on all glass to air surfaces ensure extremely high transmission rates and eliminate off axis stray light giving extremely high contrast bright images, a must have for use with the Bino viewer.